Read about Woyzeck in the New York Times…. 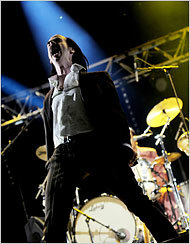 Nick Cave of the Bad Seeds performing in France in July. Mr. Cave, Mr. Ellis and Mr. Gardarsson had long conversations, but the Bad Seeds went on tour without Mr. Cave’s committing to write songs. Mr. Gardarsson almost gave up. Then, one Saturday, he got a telephone call from Mr. Cave. Mr. Gardarsson is a former championship gymnast who studied acting at theater school, then turned to directing and was a founder of the Vesturport Theater troupe, based in Reykjavik, in 2001. “Woyzeck,” performed in English, is the company’s United States debut, which is part of the Next Wave Festival at the Brooklyn Academy of Music. It met with repeated acclaim in Britain. Mr. Gardarsson’s adaptation of “Romeo and Juliet,” which received rave reviews in London in 2003, had actors bouncing on a trampoline and swinging from a trapeze. His “Woyzeck,” which has been performed in Iceland as well as in Britain, takes place on a stage set with a factory’s stylized industrial piping and a row of aquariums representing the river, in which characters splash, grapple, make love and drown. Various performers are airborne, including a violinist modeled on Mr. Ellis, and a soldier, Büchner’s crude Drum Major, who dives into view on a bungee strap. Mr. Cave isn’t the first major rock songwriter to take on “Woyzeck.” Tom Waits wrote songs for an adaptation by Robert Wilson that came to the Brooklyn Academy of Music in 2002, and released them on his album “Blood Money.” Neither Mr. Cave nor Mr. Gardarsson heard the Waits songs until their own version was complete, they said. When Mr. Gardarsson did, he said, he heard similarities. He traces them back to the play itself. “Woyzeck” plays on Wednesday, Friday and Saturday at the Brooklyn Academy of Music, 30 Lafayette Avenue, at Ashland Place, Fort Greene; (718) 636-4100 or bam.org.